We have 2,000+ sterling silver charms to choose from. Pick your charms by package or individually. If you pick you charms individually you will be able to give us information at check out regarding the color of ribbon and brides name. We have pre-packaged 6-packs of wedding cake charms! It is easy to stay within your charm budget, shop our Traditional charms listed by price. Read More About Our Shipping & Handling Policy. Did you know??? 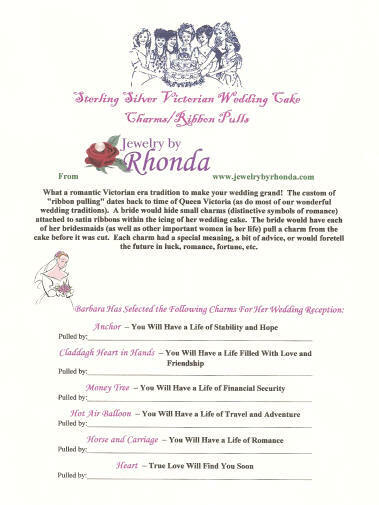 Rhonda is more than happy to personally assist you with your charm order over the phone. It's easy - contact Rhonda. You will receive a keepsake personalized charm card - the card is personalized with the bride's name and charm cake event, each charm is listed with it's meaning, there is a line to record who pulled each charm. 1. 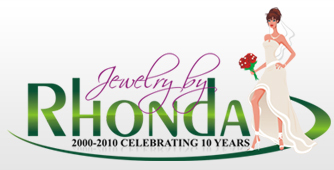 You can order on-line through our secure shopping cart system. 2. You can email us your order and we are happy to assist you via email.